Dr. Jeffrey C. K. Lim, certified Financial Risk Manager (FRM1) and certified Professional Risk Manager (PRM2), is currently the Managing Director of PI ETA Consulting Company, a Treasury and Financial Risk Management Consulting Company. A Chartered Scientist (C.Sci.3), a Chartered Mathematician (C.Math.4) and an elected Fellow of the Institute of Mathematics and Its Applications, U.K. (FIMA), Jeff earned his Ph.D. in Stochastic Financial Modeling from the University of Cambridge in England. Jeff’s research interest at Cambridge was in the area of Arbitrage Opportunities occurring in the Mispricing of Financial Options, and his original research culminated in the publication of his doctoral dissertation entitled: “Multi-period Mean-Variance Option Portfolio Strategies”. Jeff was an authorized Securities & Financial Derivatives Representative in London, having been certified by The Securities and Futures Authority (SFA) in England, where he started his career as a Derivatives Analyst with Nomura International in London, England. He subsequently joined NatWest Markets from London, England to become its Head of Currency Structured Products for South and South-East Asia. Jeff then moved to American Express Bank to become its Director of Structured Products, prior to assuming his current position. Jeff has also contributed to the development and enhancement of talent and infrastructure for Singapore's financial center as a guest Professor at the National University of Singapore’s Center for Financial Engineering, where he was responsible for the curriculum of its Master of Science degree program’s core modules in Financial Derivatives and Treasury Management. In addition, Jeff has also been invited by the Nanyang Technological University and the Singapore Management University to share his expertise in a similar capacity. In recognition of Jeff’s expertise and experience in the field of Treasury and Financial Risk Management, the University of New South Wales Asia appointed Jeff to be its first Adjunct Professor with the university’s Division of Business and Humanities. At PI ETA Consulting Company, Jeff was principal Inventor in two of the Patents that the company currently holds - one in Treasury and Financial Risk Management Systems, and the other in Knowledge Management Systems. Professionally, Jeff is a Fellow of both The Global Association of Risk Professionals (GARP), U.S.A. and The Professional Risk Managers International Association (PRMIA), U.S.A. He is also a Fellow of the Cambridge Philosophical Society, U.K. and a Life-time Member of The Cambridge Society, U.K. Jeff is also honoured to be a Fellow of The Cambridge Commonwealth Society, U.K., having been previously awarded the Cambridge Commonwealth Trust and the Shell Group of Companies Doctoral Research Scholarship. As a special recognition of Jeff’s professional achievements, on 9 April 1999, Barons Who’s Who conferred Jeff with the Barons Fellowship status, making him a Barons Fellow (B.Fel.). This award by their Charter, is limited to only the top 10% of those selected for publication in Barons Who’s Who International. 1 The Financial Risk Manager (FRM) designation is awarded by The Global Association of Risk Professionals (GARP), U.S.A.
2The Professional Risk Manager (PRM) designation is awarded by The Professional Risk Managers International Association (PRMIA), U.S.A.
3The Chartered Scientist (C.Sci.) designation is awarded by The Science Council, U.K.
4The Chartered Mathematician (C.Math.) 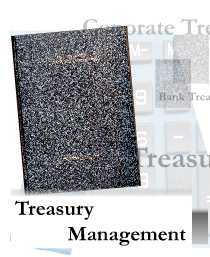 designation is awarded by The Institute of Mathematics and Its Applications, U.K.
To acquire a deeper understanding of the contents of this book, you can attend our Treasury Management.